Food corporation of India has Released FCI Rajasthan State Group D watchman exam 2017 admit card, download from official website. 1. The FCI Rajastahn Group D Watchman Admit Card for the written examination is published on the regional websites of Food Corporation of India. 2. FCI Rajastahn Group D Watchman Candidates who have filled up the online application form must open the regional website of FCI from which they made their application. 3. After opening the home page, the candidates will get the link for downloading the admit card of the written examination. 4. After clicking on the link, the candidates have to enter their Registration Number and Password and then click on Login. 5. 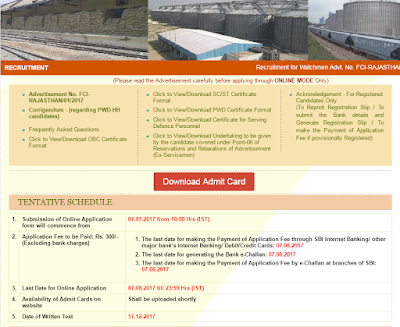 After login, the candidates will be able to view and download the admit card for FCI Rajastahn Group D Watchman.